Today’s flight took us down to Richmond VA where we picked up our passenger Diana. From there we flew her up to Gaithersburg MD for her medical appointment. After having lunch with Diana we headed back home. Our flight conditions to Gaithersburg were a little different than our flight down to Richmond….. those nice tailwinds we had enjoyed were now headwinds and the smooth ride we had earlier was now becoming quite choppy. ATC took us west around the DC restricted area but they really treated us well by vectoring us as close as they could all the way around until they could give us direct to the airport (Thank You ATC !) Moderate turbulence was being reported by many aircraft below 5000 feet…… and we did experience some pretty good chop as we were descended down approaching Gaithersburg. We made a visual approach to runway 32 in fairly strong gusting crosswinds (gust across the runway were being reported at 16 knots) As we walked into the FBO we found out that it was not only windy, it was also quite cold ! 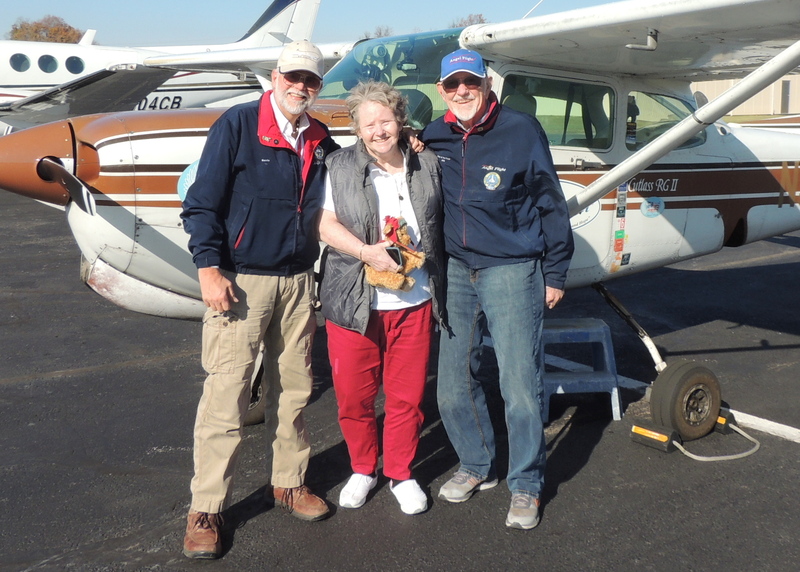 We were still ahead of schedule so we decided to ask Diana if she would join us for lunch (They have a Great place to eat at this FBO !)…. she happily agreed and we all 3 enjoyed some really great Reuben’s along with some great conversation ! After our nice lunch with Diana we gave our goodbyes and saw her off to her appointment, then we headed on out to 49Bravo and departed Gaithersburg on runway 32 headed for home. Our flight back home at 6000 feet was a little choppy along with some headwind component. Once back into our home area we made a visual approach and landed straight in on runway 22. Then after tucking 49Bravo back into her hanger we enjoyed a very nice hot cup of hanger coffee and discussed things of much importance ! Then …. as always, we started off on one of our most dangerous parts of the day…. the drive home ! Total flight time for today’s flight was 3 hours covering 300 miles over 3 States. This was Angel Flight Mission number 414 for Captain John and Angel Flight Mission number 284 for Nevin. We treated Diana to Lunch before her appointment and she brought her new friend in and set him at the table with us ! Having lunch with Diana before her appointment (We all enjoyed Reuben’s)…… notice the little stuffy setting at on the 4th chair ! Thanks for viewing and as always, please feel free to leave comments …….. We love them ! Have A Great Day ! When you left RIC you had a small plane out of RDU right behind you. They vectored him just East of Dulles and you just West of Dulles, so he landed just ahead of you. I love the way you put the nose wheel right on the white center line even with crosswinds. Good job! Great picture of Dulles. That airport was named “Chantilly” when opened. Ike wanted it changes to Dulles for his Secretary of State –John Foster. This Thanksgiving day for our family will contain much thanksgiving to God for Angel Flight and especially you two guys for the wonderful things you do for so many!